I ordered an e-book from our library when I couldn’t get there, so I looked for one of my favorite topics – getting organized. 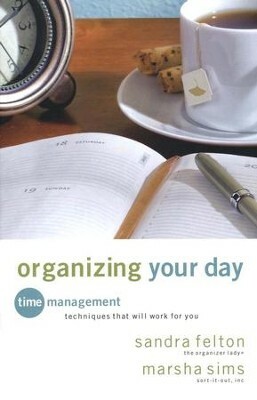 Sandra Felton and Marsha Sims wrote a book called Organize Your Day: Time Management Techniques That Will Work for You, published by Revell Books, Grand Rapids, MI and copyrighted in 2009. What I love about their books is their motto about taking “small” consistent steps to effect real change. In this book, Sandra Felton and Marsha Sims give four styles of organizing charts. One that caught my attention was for a man with such a broad range of interests that he wrote sixteen things he wanted to do. Of every two items, the man chose the most important and soon the list was down to eight. Once again-the most important whittled down to four. It forces the planner to think-now it’s down to two. Final choice, what is the most significant thing to the individual? The man felt relief, one thing I can focus on until it’s done. This morning as I read in the Jesus Calling Devotional Bible, published by Thomas Nelson Nashville, TN; Dallas, TX; Mexico City, in Mexico; and Rio De Janeiro, in Brazil; and copyrighted in 2011, there was a devotional page which I thought was from Sarah Young’s book, Jesus Calling. Jesus Calling, was copyrighted in 2004 and published by HarperCollins Christian Publishers, Nashville, TN. On page 1037 in the Jesus Calling Devotional Bible, there’s an entry entitled “Protection” and it’s got a reference: “(From Jesus Lives by Sarah Young)” on the bottom of the page. She reminds us that Jesus is with us in the good times and the bad times. When we’re struggling during times of affliction, He’s even closer than usual. Jesus is our protector if we ask Him to take control over our lives completely. He helps us to release the tight grip on our lives in a manner that we can deal with, if we really mean it. He’s not a mean task master in the sky. He’s a loving Father, beyond what any earthly dad could ever mirror with their behavior. I hope you are well. May God bless you and protect you, lead you and guide you if you want Him to. Psalm 25:4-5 (NKJV): Show me Your ways, O Lord; Teach me Your paths. Lead me in Your truth and teach me, For You are the God of my salvation; on You I wait all day. I began my day in a strange way today, thinking of the future with tears in my eyes as I pictured a sad probability. As I sat with my Bible and opened it to read, the first thing I saw was Psalm 23: 4b-6, (NKJV): I will fear no evil; For You are with me; Your rod and Your staff, they comfort me. Most experts say if you haven’t used it in a year, etc. Some say to put the stuff in a box or bag, store it away and in a year if you’ve never gone near it, don’t open it! Give it to your favorite charity or sell it. I read beyond Psalm 23. Psalm 24: 3-5 (NKJV) says: “Who may ascend into the hill of the Lord? Or who may stand in His holy place? He who has clean hands and a pure heart, Who has not lifted up his soul to an idol. Nor sworn deceitfully. Now for His grace to walk it out. My brother and sister-in-law uprooted themselves to help take care of her parents in their latter years. Love is not easy at times. They’re sacrificing for others, and yet they’re enjoying this precious time with family. As a young mom, I learned to discipline my children in a consistent manner even when it broke my heart to see them cry. When they got older I wouldn’t let them watch violent movies or see R-rated or worse films. Sometimes my husband and I were too restrictive over other matters and we needed to learn to see things from their point of view. Our children heard us say we’re sorry but I think they understood we were looking out for their best interests. After more thoughts this morning, this came to mind, what shall I do today? Go to the ant, O sluggard, Observe her ways and be wise, Which having no chief, Officer or ruler, Prepares her food in the summer, And gathers her provision in the harvest. I, too, have no one barking commands at me. My husband gives suggestions occasionally and then he gets on with his day. It’s not that I don’t like housework. I get bored. After lots of hours alone, I want to see people. The point of cleaning and organizing beyond the removal of germs and bad smells and nerve-wracking messes is love. Love for others sharing the home, love of self, love for others stopping over, even love or respect for the neighbors shows up with a tidy place. I thought, if that doesn’t motivate me to continue on with this organizing quest I’m on, nothing will. When I start my day in God’s Word and in prayer, I’m centered and reminded that His love goes with me and upholds me. When I feel I have too much to do I break it down to smaller steps. I’m trying to remember that I have time to continue and if people interrupt, people are more important. Too much self-centeredness does not make the world go ‘round. When it’s all about me, joy and love get sucked away. I know. I’ve been there and done that and missed out on simple pleasures of life because of complaining and a stinking attitude. God help me; I don’t want to go there. I’ve decided to eat healthier, which means to me hardly any meat and very little dairy. I began today with some other areas to limit stuff, as well. So, as I prepared dessert for a group meal, I had to decide. Gingerbread with whole wheat flour and the added chore of making homemade applesauce because we didn’t have any on hand, or making a gelatin with agar agar and fruit juices. I chose the gelatin for a few reasons and began around three o’clock in the afternoon for a 6:00 meal. After I poured the hot liquid into the bowls and added fruit, it suddenly occurred to me that when it was piping hot, it couldn’t cool in minutes. Especially the biggest bowlful, which had seeded fruits in it and only one person couldn’t eat seeds. Seeing as how the weather outside was frightful – I couldn’t resist, at almost 20 degrees Fahrenheit, (freezing is 32 degrees Fahrenheit), I decided to put them on the front porch and check often so they didn’t freeze. After we got home I noticed I felt a bit grumpy even though we had a good time. I know better than to start more than one major project at a time, but I’ve committed to two things and once I commit, I try my best to follow through. The organizing thing is not requiring a lot out of me for the first two weeks of January and the author, Regina Leeds, said it goes faster if you’re able to make decisions quicker rather than slowly. I’ll see how it goes when I get to that point. She wrote, One Year to an Organized Life: From Your Closets to Your Finances, the Week-by-Week Guide to Getting Completely Organized for Good, copyrighted in 2008 and published by MJF Books, New York, NY if you haven’t read this blog previously. I went to the internet to find her and got watching small videos on YouTube. The decision- making YouTube episode for getting rid of clutter is called, “Quadrant Method for Clearing Clutter,” 6:13 time or six minutes and thirteen seconds. That was helpful. Do you struggle with decisions and/or second guess the ones you’ve made? It’s humbling to join with folks and admit you’ve got a problem you’ve struggled to overcome. It’s also exhilarating to know you’re not alone. So we left the meeting with the words commitment, hard work, and support as some of the parting promises to one another. I read some women’s magazines with articles off topic from organizing which made me want to write an article for one of them. I’ll need to do some research on the subject and on marketing. Some magazine editors don’t accept articles from writers if they haven’t sold to a magazine with a huge following. I truly believe that God orders my steps in mysterious ways sometimes. We’ll see where they go. May God bless you as you step out in life. I’ve been working more on a transposing assignment for a man who hopes it’ll be done by Christmas. We miscommunicated at the beginning so it’ll be quite the feat if I get it done. I just decided to check out how many more pages are in the handwritten notebook and couldn’t find it. Did I put it away and the zip drive, too? Yes, I did. There are times when I’m driving and my mind is on something else and suddenly I’ll realize I’m almost at my destination. I guess I tidy up on autopilot as well. When I went to figure out my day in the planner, the date jumped out on me. I know Christmas is on Sunday, but how can Sunday suddenly be less than seven days away. So, I’d better get a package in the mail tomorrow. I’d better get my cards signed tomorrow or Wed. I’d better get up earlier in my day before the phone starts ringing so I can type for my client. I’ve been handing things over to God this week and hopefully they’ll stay there. One of those things was getting stuff done. I’ll do my best and leave the results up to Him. One thing I like about helping people with their memoirs is the fun of seeing their choices. I’ve had clients with interesting lives and sometimes I imagine myself in their shoes and wonder if I would have done the same thing. Would I have had the stamina and courage and enthusiasm to do what they did? We’re all wired so differently. I’ve been singing a friend’s song this week and it reminded me that I wrote a song once and gave it to a fellow to see if he could come up with the music. I hope my copy is in the file cabinet. I begin the organization class in January, not too soon. I’ve been working on organizing since November, but this month has been more hit and miss. I decided when I was a busy mom to stop stressing over Christmas. I didn’t think God wanted me to go huge on gift giving since His Word says to do all things in moderation, (Php_4:5, (KJV): Let your moderation be known unto all men. The Lord is at hand. His Word also says not to owe people anything but love. Rom_13:8 , (KJV): Owe no man any thing, but to love one another: for he that loveth another hath fulfilled the law. I don’t mind being on autopilot if I’m throwing the garbage into the outdoor cans, but if someone stops at the house, I don’t want to immediately think of the ten things on my list and start re-ordering the timetable and miss out on them. I want to be fully there. I hope this finds you well and at peace. May God bless you.